There was one glorious time when the truth about Big Franchising was revealed and recorded. March 6, 7, 8 and 9. Public hearings into the franchise relationship. Four days of traveling public hearings: Toronto, Sault Ste. Marie, Ottawa and London. Ontario, Canada. Traveling public hearing: extremely rare, if not unheard of, under the Mike Harris government. 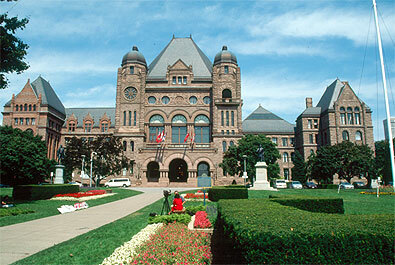 Approved by the former Ontario Minister Robert Runciman over a beer with Tony Martin at the Queen’s Park members’ bar. Two men who share a love of democracy as expressed in the Legislative Assembly of Ontario. 35 life stories told in 20 minute chunks to the Standing Committee on Regulations and Private Bill. 4 expert witnesses given 45 minutes (John Sotos lawyer, Susan Kezios franchisee expert, Dr. Gillian K. Hadfield scholar and Richard Cunningham franchisor advocate). and me, Les Stewart, franchisee advocate. I had the tremendous honour of traveling throughout Ontario as before these life stories were twisted into the Arthur Wishart Act (Franchise Disclosure), 2000. I seemed to have made an impression on the politicians. Of the current MPPs (107), I know 29 of them. One Minister since I was 17 years old. 45 minutes from my house to their House. This entry was posted on Wednesday, July 25th, 2012 at 7:00 am and is filed under Big Franchising, Confusion & Deceit, McLaw: Make-believe fairness, WikiFranchise.org. You can follow any responses to this entry through the RSS 2.0 feed. You can leave a response, or trackback from your own site.